BlackBerry PlayBook Native Email and PIM Running via BlackBerry OS Emulation?!! Makes hybrid QNX/BB OS plausible on new phones? With BlackBerry World 2011 now behind us, it's time to reflect upon all the news and things we saw. 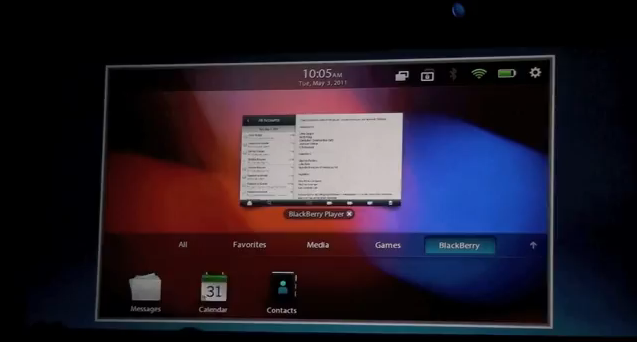 One of demos that really blew me away was of native email and PIM running on a BlackBerry PlayBook. Yes, we knew RIM said it was coming, but I was SHOCKED to actually see it in action. At first I honestly thought RIM was faking it. For the life of me I couldn't believe that RIM had already finished re-writing the email and PIM apps for QNX so they run natively on the PlayBook. Remember, these aren't just any old apps. These apps have to talk directly to RIM's Network Operation Center which means they have to be ROCK SOLID, just like native email and PIM on BlackBerry Smartphones today. We're talking secure and battle tested. These aren't just apps for RIM to quickly pump out and push live. Their reputation in business and enterprise rests on them. Watching the video above I couldn't help but think how similar the native email and PIM experience on the BlackBerry PlayBook looked to that on a BlackBerry Smartphone. Then I had an ephinany. It looks like the same experience BECAUSE IT IS THE SAME EXPERIENCE. Instead of re-writing native email and PIM for the BlackBerry PlayBook, RIM is going to run the traditional BlackBerry OS on top of QNX via an emulator to power the native email and PIM experience. To the user the actual email and PIM apps will look good and feel 100% native and the performance should be totally fine as we see in the video, but in reality it'll actually be the traditional BlackBerry OS running behind the scenes to deliver this experience (as pointed out in the comments, jump to 1m11s in the video to see the BB6 styled radio off indicator in the app). You won't see the BBOS, but it'll be there. At least for now. Remember, along with the announcement of the Android App Player, RIM also announced a BlackBerry Java player that would support running BlackBerry Smartphone apps on the PlayBook. When I left BlackBerry World last week I was wondering why RIM didn't show this off, but it turns out they did without us realizing it. The Android App Player works by actually having a full version of the Android OS running on the PlayBook, and that's the same case here now on the BlackBerry side of things. So with the BlackBerry OS running on the PlayBook, RIM can not only support BlackBerry Java apps if they want to, but they can run the native apps from the BBOS on the PlayBook as we're seeing in this video. RIM has a lot of employees, so I guarantee there is a team of them working on re-writing everything for QNX natively so that one day in the not so distance future the BlackBerry OS as we know it is completely phased out. But in the meantime this ability for the QNX OS to run the BlackBerry OS in an emulated environment is brilliant. Per above, it allows RIM to push out native email and PIM onto the BlackBerry PlayBook fairly quickly. BUT where this gets REALLY interesting is on BlackBerry Smartphones. I'm assuming that running the BlackBerry OS emulation would also give the RIM the ability to tap into the radio stack of the BlackBerry OS if they wanted to you know, put the QNX OS onto a Smartphone that was already running the BlackBerry OS on 3G. Why is that significant? Well let's think about it. We know RIM and RIM's CEO's have talked about QNX-based superphones and that QNX is a dual core play for RIM. However, we've ALSO heard for a while now about a HYBRID OS being in the works that brings the best of the traditional BlackBerry OS together with QNX (we previously called it BlackBerry 7 until BlackBerry 6.1 got rebranded to BlackBerry 7). So what would a QNX/BBOS Hybrid OS look like and how would it work together? I think you're sort of looking at it. QNX is the base OS, providing the homescreen and app experience and app development platform, while the BlackBerry OS runs in emulation mode - providing the radio connection to the carriers and delivering the native email and PIM experience. It's the best of both worlds until RIM has a chance to natively write everything for QNX. You know where I really start to get excited and get my hopes up? While RIM's CEO has said QNX is a dual core play, I actually believe that this QNX/BBOS hybrid could run just fine on a device like the BlackBerry Bold 9900/9930. Just watch the video for the Snapdragon processor in the new Bold. It's a SOLID processor and the device has solid hardware specs all around. Maybe they upped the built-in storage memory to 8GB so that for the day when the hybrid QNX/BBOS arrives to the new Bold you can then install apps onto that storage space (with BlackBerry 7 apps are still getting installed into flash memory, of which there is only 768MB on the new Bold - an app like Need for Speed on the PlayBook is over 350MB so would never work, but with a QNX/BBOS hybrid OS using non-flash memory for running apps it could sit and run from that 8GB of storage space). With RIM's next wave of high-end hardware coming late summer/early fall, including the new Bold, new Torch, new Touch (monaco/monza) and basically running on identical hardware platforms (just the form factors change - excluding Curve which is on the older Marvell hardware), it would make sense that RIM has this new generation hardware platform prepped for the hybrid OS. This would greatly extend the product life cycle of these devices as well as their value proposition to consumers as RIM works towards the followup generation of hardware we see later 2012 where we're rocking dual-core full QNX BlackBerry superphones. I know I know... it seems a bit crazy. And of course I could be wrong here as this is my take on connecting the dots vs. RIM official word. But it all makes so much sense, no? Be sure to sound off in the comments with your thoughts on this. On crack? Or crack'd the story?